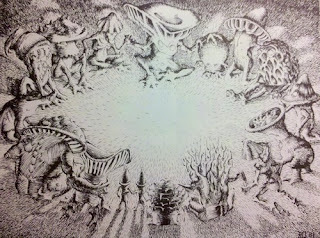 The myconid was introduced in Dungeon Module A4 - In the Dungeons of the Slave Lords. 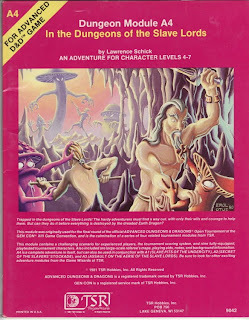 The cover of the module shows our intrepid adventurers, recently freed from slavery locked in fierce hand-to-hand with the mysterious mushroom men. This cover proved to be quite misleading though, as the myconids tend to be a rather peaceful race, and even my normally bloodthirsty players failed to engage in any sort of combat with a single myconid. Despite their lack of usefulness as a hostile encounter, I still have quite a number of miniatures representing these creatures. First up, is the impressive Reaper Mushroom King (3041), and two Mushroom Men (2679). The larger miniatures come in two pieces, but are quite easy to assemble. The Mushroom King is covered in details, and one of my favorite miniatures. Next are two Hasslefree Agarix (HFW500 A & B), and four Ral Partha Mushroom Men (01-046). The Agarix come in a pair, with a sprue of four separate arms which can be mixed and matched to generate a number of different poses. I found the arms a bit fiddly to glue in place, but they are nice, well cast miniatures. The delicate looking Ral Partha Mushroom Men come in a set of four, and are nicely detailed. They are still available from Iron Wind Metals and Ral Partha Europe. The Grenadier Fungoid (Monster Manuscript MM27) and the D&D CMG Myconid Guard (Aberrations #41) are in the next picture. The Fungoid seems a bit out of sorts, and perhaps missed his melding session. The miniature is still available from Mirliton. The D&D CMG myconid is OOP, but I don't think it's so difficult to find. Last up, are the Khurasan Fungoids (PLA-15). These are tiny miniatures with very small caps. I think they're quite suitable for juvenile myconids. Do you take requests? I'd love to see a rundown of 1:72 appropriate wizards and halflings. 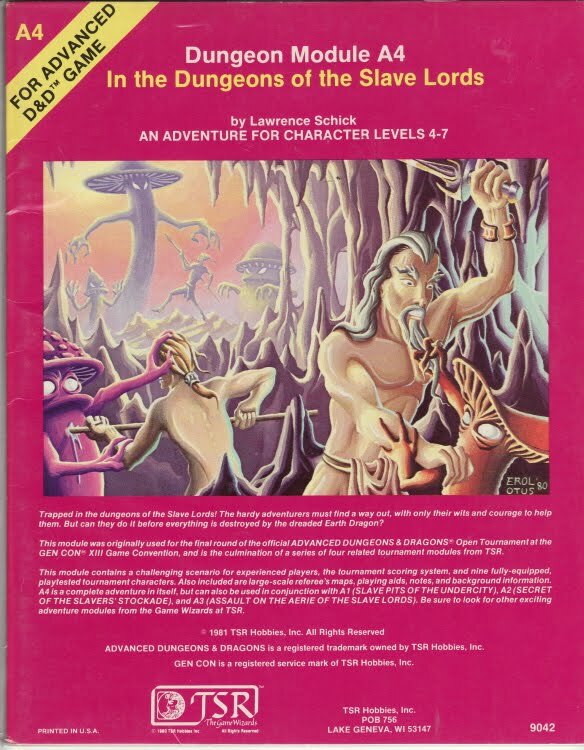 Dudes with swords and various monsters seem in sufficient supply to go 1:72 plastic for D&D, but I'm worried about having good choices for these two player character types. I'll also mention that the 15mm halflings from Irregular are not half bad. For wizards, I'll see if I can get something together. Off the top of my head, besides Caesar, the only 1/72 compatible spellcasters that I've found are early Ral Partha miniatures. I've modified some old Grenadier figures as well.